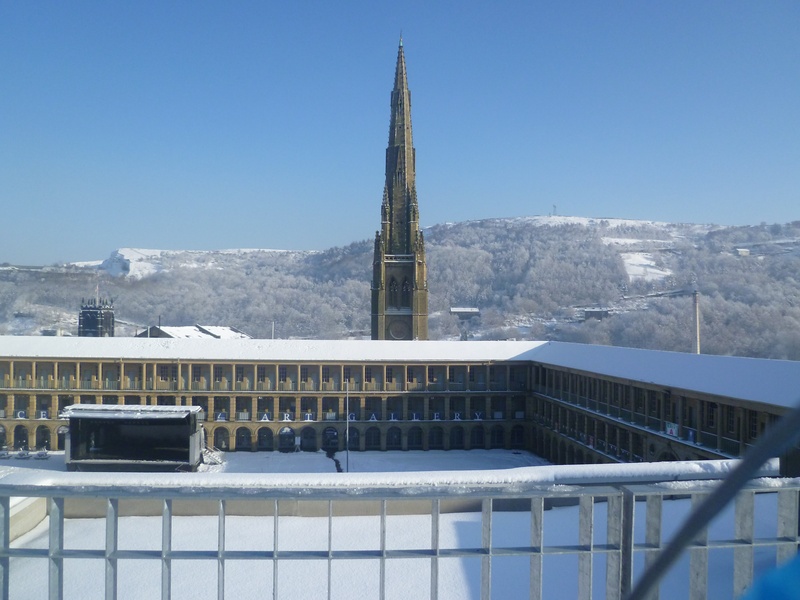 – is a place in which it is more common for folk to talk openly about spiritual well-being than it is in Halifax, West Yorkshire…..
– would be a more obvious part of the world, than say Halifax, West Yorkshire, to focus on when researching spiritual well-being…..
At Orangebox we are aiming to create an environment in which young people can realise their ideas and realise themselves. So what might realising yersen (1) look like when it’s at home (please note I have allowed myself only one use of stereotypical Yorkshire dialect in this blog)? Well this is where my main man Viktor Frankl comes in handy. As you know from my last blog I am using Frankl’s logotherapy as a framework for defining spiritual well-being. Essentially Frankl considers human-beings to be spiritual entities motivated by the search for meaning, by self-transcendence – the ability to act for values and others beyond the self. Logotherapy states that we bring our values to life by achieving tasks, by experiencing nature, beauty, art, and by loving another. But even people who find themselves in the greatest distress (such as Frankl experienced as a prisoner of second world war concentration camps) – in which neither activity or creativity can bring values to life – they can still give their life meaning by the way they face their fate or distress. We all have the ability to choose our attitude, to determine our attitudinal values. In order to act for the sake of your values you need to be alert to the voice of your conscience. Conscience comes from what Frankl refers to as the noetic realm (or the spirit); the authentic self rather than the automatic self (the psyche). Frankl argues that there is more to us than drivers, emotions and instincts – through the noetic realm, regardless of circumstances or conditions, we can determine our actions, our experiences or at the very least our attitudes. Fundamentally we need to learn to go beyond the automatic self and tune into the authentic self. So translating this into the Orangebox context we will need to offer a broad range of opportunities to support young people’s development and exploration of their sense of self –enabling them to try things out, to rehearse (whether it’s a play, a business idea, or a new sense of personal identity). We need to offer space, flexibility, and be responsive to requests alongside programming activities and services that we know enable self- expression, personal agency, and responsibility. If we’re offering programmes that claim to develop things like ‘employability’ we need to think hard about how to take a holistic rather than a tokenistic approach; we must not stop at developing functional skills or writing a CV but also find ways of exploring with the young people how employment might meet existential needs and if it doesn’t then how can broader life practice be developed to meet these needs? I am delighted that both sets of Orangebox tenants (a statutory and a voluntary youth agency) share these interests and are keen to collaborate on developing and evaluating young people’s sense of purpose. In many ways the world is seemingly smaller today but growing up in the 21st century is complicated and uncertain. Meaning making and subsequent self-transcendence is clearly more of a challenge during a period in which ‘values are in transition. (2)’ – the material world presents multiple opportunities to succumb to the will to power or the will to pleasure. As such we need to find and promote practices that ‘work towards an honest engagement in the world, focussing on the vital material that binds us to the world and gives our life meaning (3)’. Young people (particularly those growing up in a post-industrial northern town) are dependent on their own initiative, positive relations, and support networks to live healthy, confident, and happy lives. Orangebox will respond to the evolving needs of local young people. Just like a teenager, Orangebox needs to embrace liminality so we can continually create points of connection for local young people to regional, national, and international networks and opportunities. With all of this in mind I wonder why the UK has overlooked logotherapy when it has been embraced all over the world? Perhaps it is because concepts such as spiritual well-being are still too scientifically unpalatable (although please note though that Frankl was not a California new-age hippie but a Professor of Neurology and Psychiatry at the University of Vienna Medical School and served for twenty-five years as head of the Vienna Neurological Policlinic)? Even putting politics aside, the current attempts by the UK government to measure happiness completely miss the point in my view– happiness is a by-product of having achieved something meaningful not the primary goal. So despite my opening with seemingly cynical references to the potential vast difference between California and Yorkshire I actually think the latter might prove a natural place from which a logotherapy movement could grow not least because we have amazing countryside to support experiential values and (excuse the generalization) a pretty humorous attitude to life(4), helping us triumph over adversity. For Frankl humour is a way of self-distancing, seeing the funny side of your behavior but also something that comes from the noetic realm. As such one of the first programmes we’ll be running over the summer at Orangebox is a stand-up comedy course with The Comedy Trust. So watch this space or even better get in touch if you want to support us in ensuring that Orangebox is a spiritually healthy place for young people! Thanks for reading, I’ll leave you with a view from the Orangebox rooftop….. This entry was posted in Uncategorized and tagged Calderdale, California, comdey, drama, Halifax, Happiness, logotherapy, research, Yorkshire, Youth Work. Bookmark the permalink.